Speak French ? Speak it better! If you've taken the time to learn French here's the proven way to take your vocabulary and listening-comprehension skills to the next level. Speak a foreign language? Speak it better! 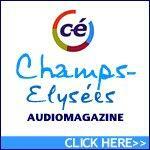 Improve your language skills with Champs-Elysées monthly audiomagazines for intermediate-to-advanced speakers of French, German, Italian and Spanish. Each issue of this fascinating cultural language program comes with a 1-hour CD/cassette and a 60-page printed magazine containing a full transcript and notes and glossary in English. We have a special offer available through Franceinlondon.com - Click on the link below to take you through to the Champs-Elyseés shop and receive an extra issue worth £18.50 absolutely free!